01. All of the airplane’s major subassemblies, including the stock plastic cowling molding, are laid out together. My article, "Don’t Forget Those Guillow’s Kits," in the July 2018 issue of Model Aviation, presented some background information on Paul K. Guillow, Inc. I included a photo of two models built from the Guillow’s No. 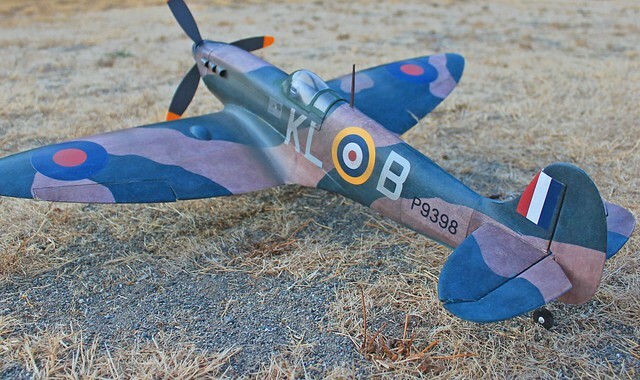 403 Spitfire kit to grab your interest. Because of space limitations, it was not possible to share the whole story and, in fact, I was not yet ready to fill in the final details. It would require me to build a third No. 403 conversion to get everything right before presenting it to you in print. Now I can share with you how it all worked out. If you have an interest in the possibilities for electric RC conversions offered by that extensive product line of traditional stick-and-tissue balsa scale kits, I suspect that you also have a serious list of questions about what might be possible with them. With that in mind, I will begin this chapter of the story with some answers. Let’s start with the most obvious question: Will it work? Clearly, the answer is yes it can, but there are some conditions that must be met to get a flight performance that will be worth the effort you will invest. 02. Right from the beginning, things will be changed. The author mentions the importance of getting the right airfoil if planning to do any fighter-level (fast) Guillow’s conversions. The answer to the problem posed by the flat-bottom, sharp, leading edge wing sections in the lower-number series is found in the SBD-3 Dauntless and Hellcat kits. These two series 1000 kits use a thicker semisymmetrical airfoil that designer Mark Tennant explained was developed as an alternative for customers who wanted to finish their models as glow engine-powered Control Line aircraft. Mark sent the author No. 403 Spitfire-size ribs laser cut to the new section. The author tried it and it works fine. Here, you can see some of those new ribs spread out over the left portion of the wing plans. 03. The bottom surface skins (more 1/16-inch sheet balsa) have been glued into place, allowed to dry, and their outer edges were sanded clean. Perhaps the most apparent concern is whether it will add too much weight. It might. Every Guillow’s kit conversion from the original rubber power configuration will add weight. For any kit, that will depend in large part on how much you change. For discussion purposes, I will simplify/categorize a broad range of possibilities as either a maximum lightness or a maximum practical detail project. Regardless of which way you choose to go, several issues must be addressed before you cut any balsa. These are the wing section (airfoil), flying surface incidence, and balance. I’ll discuss these in detail relative to a variety of kits as I go along. Maximum lightness means sacrificing some scale accuracy and detail by using only the most basic structure—the smallest possible micro motors and RC gear (such as the systems found in tiny foam park flyer ARFs). Take advantage of every possible opportunity to save weight by substituting material and/or removing structure to keep with the original tissue-covered, open-structure concept. Also, exercise your model building skills by doing the best, most accurate work you can to produce a slow-flying, low-inertia model that will be just right for indoor or calm outdoor flying sessions. 04. A tracing paper pattern of the landing gear/wheel well openings was made from the plans and taped in place to prepare to make accurate cuts to create those openings. 05. This part is a big departure from the original Guillow’s kit design. The author is sheeting/covering the entire fuselage with soft, straightgrained 1/16 balsa sheet applied wet and attached with Deluxe Materials Aliphatic Resin glue. 06. The tail surfaces were built using all of the original Guillow’s kit parts. The necessary structure was added to define the rudder and elevator surface separations. Maximum practical detail means just that: Making your model as realistic/scalelike as possible using sheet-balsa covering on simulated metal surfaces, retractable landing gear, opaque scale appearance finishes, etc. That means that you will have a faster, heavier model that will demand to be flown at a larger RC field, but will also handle wind and weather. The big question is about how far you can go. That’s what the rest of this article discusses. A lot of the choices you are about to make in this respect depend on which aircraft in the Guillow’s kit series that you choose as your project. I’ll enumerate the ones that, in my experience, offer the best subjects for what I am discussing. The series 200 kits (which are now laser cut instead of die cut as in the past) are all World War I biplane fighters designed to a 24-inch wingspan at roughly 1/14 scale. These kits have been around since the 1950s and might be the Guillow’s kits that old-timers remember best. Right alongside these are the series 300 civilian lightplane designs which, like the 200 kits, are now laser cut. All of the series 200 and 300 models are good candidates for RC conversion. In my experience, they will all work if weight is your major concern. Note: In the March 2018 issue of Model Aviation, you can find my "Applying Silkspan" article, which features the 301 LC Aeronca Champ and includes information on the motor and control equipment used. Next in line are the series 400 laser-cut World War II fighters—all of which are designed to 1/16 scale with varying wingspans that are slightly less than 30 inches. These include the Spitfire featured here. They are the smallest of the Guillow’s kit series that I feel comfortable converting with the goal of maximum practical detail. I have built several of them that fly successfully at 16 to 18 ounces using 2,200 Kv brushless motors powered by 3S LiPo battery packs. There are several airplanes from which to choose, including more fighters in the 500 and 900 series kits, but they are all on the small end. 07. Deluxe Materials Tissue Paste is the best product that the author has found to attach silkspan over solid/sheeted balsa surfaces. 08. It all comes down to this. An 800 mAh Venom Fly LiPo battery pack slips inside of the cowling and over the ESC. When pushed as far forward as it can go, it perfectly balances the airplane. 09. Those E-flite retracts are a tight fit in this little airplane, but they go in and they work. Their 16-inch wingspans and minimal structural design dictate that only the lightest micro brushless motors and lightweight covering (such as tissue) are likely to provide the performance you want. I can’t recommend them as the best place to start unless you already have some Free Flight Scale building experience. The 800 series with larger wingspan/wing areas offers several excellent conversion candidates. The Stearman PT-17, Sopwith Camel, and Cessna Skyhawk 172 have been successfully converted by experienced model builders. I believe that 2,800 Kv series brushless motors would be a good place to start with these kits. The kits also offer the advantage of having working control surfaces and other neat details included, so you don’t have to add any of those features. None of the models in the series that I previously mentioned include that bit of extra kit engineering. Kits such as those in the 400 series require that you design the extra structures over the existing plans and build them on your own. I am still not done looking at kits. I believe that the series 1000 WW II fighters and bombers might be the best of the entire Guillow’s line for RC conversion. There are five of them: the Junkers JU-87B Stuka, Republic P-47D Thunderbolt, Vought F4U-4 Corsair, Douglas SBD-3 Dauntless, and F6F-3 Hellcat. Although the models are larger than the 400 series fighters (because those full-scale subjects are bigger airplanes), they are designed in the same 1/16 scale. This means that there are 11 RC-convertible Guillow’s WW II fighters (in the 400 and 1000 series) that are in scale with one another. These kits also include workable control surfaces and even dummy manually retracting landing gear, which will probably give you some interesting ideas. Salve ,ho costruito alcuni kits guillows rc conversion e per farli volare in alcuni ho dovuto cambiare incidenza e diedro ,esempio fw190 serie400. Mentre il corsair serie 1000 non ho cambiato incidenza e diedro. Here is Marco's comment in English: Hi, I built some kits guillows rc conversion and to make them fly in some I had to change incidence and dihedral, example fw190 serie400. While the Corsair 1000 series I have not changed incidence and dihedral. Thank you for your comment, Marco!